Of the few books released in the nearly four years since Robin Williams took his own life, none of them were written by family members or anyone who worked closely with the late actor and comedian. In fact, while he was still alive, there was an air of privacy and protection that hovered over his family and personal life, with details only coming out via the efforts of tabloid journalists. No one close to Williams had dared to cash in on what they know. That so many of those same people are now opening up to biographer Dave Itzkoff is just one of the remarkable elements of the newly published book Robin. 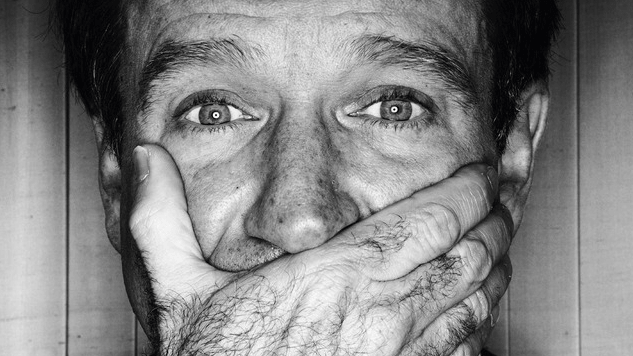 For once, fans are able to get a glimpse into what made Williams tick—his neuroses, boundless energy, generosity, love of both childish things and puerile humor—and get some sense of what may have driven him to perform that final desperate act that ended his life in August of 2014, right from the mouths of the people who knew him best. Itzkoff, a regular contributor to the New York Times, is clearly the right man for this job. He had interviewed Williams a few times and, in doing so, had gotten to know the actor’s family and friends. The pieces Itzkoff wrote were, like much of his profiles and features, clear-eyed and warm, exploring Williams’ creative spirit and the psychological underpinnings that fueled it. The result of Itzkoff’s interviews with Williams’ children, friends (like Billy Crystal and David Letterman) and folks who worked with the actor during his roller coaster of a career is a portrait of a man haunted by a desperate need for attention and validation. There’s little doubt that Williams enjoyed his years as a standup and a screen presence. But every lost laugh and every film that flopped clearly weighed on the man, no matter how much he tried to shrug it off to the press. The difficulty comes with trying to both capture every momentous stop on Williams’ journey and his manic stage work. Itzkoff does better with the former, hitting all the highlights while sticking around for the most important mileposts: Mork & Mindy, Dead Poets Society, Good Will Hunting and Williams’ often tumultuous personal life. Itzkoff can only scratch the surface of what made Williams so compelling in words; there’s a sense that he trusts readers to understand references or to at least search YouTube for themselves. Biographies like Robin, especially one written after a tragic death, unfortunately try to fill in the blanks and answer the questions that its subject left behind. In the case of Williams, it comes down to trying to understand what drove him to end his own life. On that front, Itzkoff stumbles, even as he concludes the book talking about Lewy body disease, a Parkinson’s like disorder that causes hallucinations and paranoia that may have contributed to Williams’ terrible decision. Sprinkled throughout the narrative are little hints: Williams’ distress at learning of someone he knew losing their ability to mentally function, his voracious hunger for the appreciation and affection of everyone and a troubled relationship with his father. All are reasonable suggestions, but without the subject at hand to confirm or deny, it’s pure speculation. There’s also a troubling thread that runs through the end of the book that damns Susan Schneider, the woman Williams married in 2011 and was with until the end. On the one hand, Itzkoff portrays her as the right person for Williams at the time—a figure who had her own life and interests and didn’t feel the need to follow Williams to film shoots and standup gigs. But as Itzkoff attempts to piece through the shattered life left behind by his subject’s suicide, a nasty tinge enters the prose. Both Itzkoff and Williams’ family members wonder why she wasn’t more open to his children, why she pushed him into rehab a second time as he was struggling with depression, why she fought for her part of the estate in court. Schneider isn’t quoted directly in any instance, with Itzkoff instead pulling from articles and remembrances that she wrote after Williams’ death. To more fully hear her side of the story would have been served this book and its subject so much better. As a look into Williams’ career, from its steep rise to stardom and its slow, ignominious decline, Robin is as thoughtful as ever. Stuck though he might be on box office receipts and critical reaction to films like Toys and Being Human, Itzkoff tells this story well. For fans of the actor/comedian, Robin is another reminder of what a rare and remarkable talent he was and what an unbelievable shame that it’s gone forever.